For just a few more days, you can submit comments to USDA's Food and Nutrition Service (FNS) regarding the agency's new proposed regulations for "competitive foods," including vending machines and snacks for sale. More of the foods we should encourage. Promoting availability of healthy snack foods with whole grains, low fat dairy, fruits, vegetables or protein foods as their main ingredients. Less of the foods we should avoid. Ensuring that snack food items are lower in fat, sugar, and sodium and provide more of the nutrients kids need. Targeted standards. Allowing variation by age group for factors such as beverage portion size and caffeine content. Flexibility for important traditions. Preserving the ability for parents to send in bagged lunches of their choosing or treats for activities such as birthday parties, holidays, and other celebrations; and allowing schools to continue traditions like occasional fundraisers and bake sales. Reasonable limitations on when and where the standards apply. 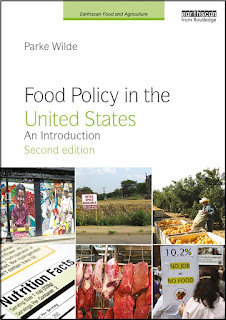 Ensuring that standards only affect foods that are sold on school campus during the school day. Foods sold at an afterschool sporting event or other activity will not be subject to these requirements. Flexibility for state and local communities. Allowing significant local and regional autonomy by only establishing minimum requirements for schools. States and schools that have stronger standards than what is being proposed will be able to maintain their own policies. Significant transition period for schools and industry. The standards will not go into effect until at least one full school year after public comment is considered and an implementing rule is published to ensure that schools and vendors have adequate time to adapt. To me, a fundamental issue is that schools are supposed to act with the child's interest at heart. No matter what your view about other health policy proposals to regulate food sales (such as sales of soda in New York City movie theaters for example), we should all recognize that schools are different. This is not a question of regulatory overreach. This is a question about whether adults in publicly funded institutions should be making money for education programs by selling high-calorie snacks and sugary beverages to young children in the midst of widespread health concerns about childhood obesity. Current information resources include earlier coverage on this blog, the FNS site, and (if you want to see an example of suggested comments from a leading public interest organization that has studied this issue closely) the Center for Science in the Public Interest (CSPI). 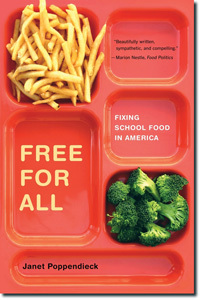 As deeper background reading, I greatly appreciate Janet Poppendieck's thoughtful book, Free for All: Fixing School Food in America (University of California Press). For local eastern Massachusetts readers, I notice that Poppendieck is giving a free public lecture at Boston University (in the College of Arts and Sciences Building, Room 211, 725 Commonwealth Avenue, in Boston, on Tuesday, April 2, 6 pm).